"The Year in Review" section of the Report contains all of the Association-related items which previously appeared in the Journal of the AAVSO: the Spring and Annual Meeting Minutes with their lists of new members, deceased members, award recipients, etc., the Annual Report of the Director, Observer Totals, Committee Reports, and Treasurer's Report. It also contains Minutes of the four Council meetings held each year and reports on VSX, variable star observing campaigns, AAVSOnet, APASS, and the Journal of the AAVSO (including Editorial Board, Editorial Staff, and titles of papers and abstracts published in the past year's Volume). 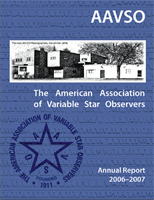 The other sections of the Report contain: information about the AAVSO and its services; lists of the AAVSO's officers, staff, and volunteers (also previously reported in the Journal of the AAVSO); letters of support from professional and amateur astronomers; lists of those who have supported the AAVSO; and information about planned giving.